Several versions are available with foam cut out for the different environmental sound measuring instruments, Nor110, Nor116, Nor118, Nor121, Nor131 and Nor140, each configured with or without space for modem and GPS. When used with the outdoor microphone protection system Nor1212, this forms a system designed for semi-permanent outdoor monitoring. The system will maintain its performance even when left unattended under severe weather conditions for several weeks. The data from the system can be transferred to a PC using the Nor1020 NorXfer software package or Nor1022 NorMonit, either via a GSM/GPRS modem (optional) or directly in-situ via a cable. Internal batteries and or external batteries can power the system. It may also be powered via mains or a combination of mains and batteries. The system is supplied with a sunscreen to protect it from heat on sunny days. 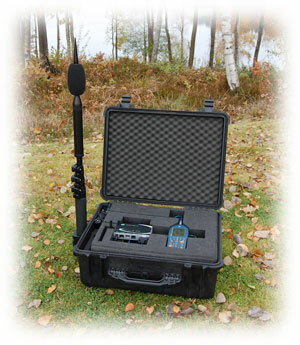 It has room for measuring instrument, Outdoor Microphone Nor1211 or Nor1212, modem, Nor1253 Calibrator, Nor1479 Cal. Adapter, microphone stand and two batteries Nor1506/Batt (these items must be ordered separately together with internal mounting kit for the measuring instrument). Cables are connected to the case via a unique weatherproof cable sleeve. This is a flexible solution making waterproof connectors redundant. A solution without external connectors is superior to avoid bad or intermittent connections.